Joanna Whittle’s residency involves counting every single tree growing along the no. 38 bus route between Clapton Pond and Piccadilly Circus. Since September, the artist has been walking the route, assiduously recording the number of each species she encounters, and plotting their locations on the map. 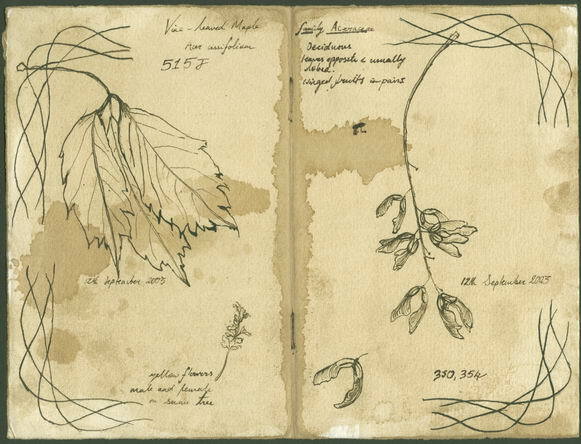 Eventually, the data would be collated and displayed next to her botanical drawings, in an installation located along the bus route, or even on board buses. The idea of the project emerged from Whittle’s landscape paintings, which also deal with the interaction between the natural and the human. The residency project addresses similar concerns in relation to real space, on a more ambitious scale. The no. 38 bus happened to be the route Whittle best knew as a passenger. She liked the fact that it is a Route Master bus, with the open back, which offers more potential to interact with the terrain. The sheer number of trees has surprised her. It has also become apparent how tied to nature the project is: for some species, she will have to delay identification until the tree flowers or bears fruits. Whittle is still open minded about the exact form the final presentation will take. Ideally, this would be in an installation along the bus route, rather than in a conventional exhibition space. Drawings and statistics could be shown inside and outside buildings along the route, or on bus shelters. Botanical data could be flashed on electronic notice boards at bus stops. More adventurously, the installation could board the bus. There could be images of trees on tickets, and stickers with botanical information on the backs of seats. Arboreal images could take over the advertising spaces, or be draped over the whole bus… The possibilities are endless. Joanna Whittle was born in 1974. She studied at Central St Martins and the Royal College of Art. She has participated in a number of exhibitions, including a solo show at Agnew’s, London (2001). Her latest installation was Badly Led Lives in Piccadilly underground station (2002).